Pennsylvania was one of the first states to adopt a state flag. The first PA state flag came into use in 1799, and the design has changed very little since then. The Pennsylvania state flag has been standardized and clarified, but the core features of its design have gone unchanged since the decades following the American Revolution. The Pennsylvania flag has a deep blue field that displays the state's coat of arms in the center. The coat of arms is made up of a shield with an eagle on top of it that is supported by a pair of horses. The shield displays a plow, a ship, wheat, corn, and an olive branch. The plow is a symbol of Pennsylvania's natural resources, while the ship represents the global trade that carries those resources to the rest of the world. The wheat represents the state's wealth, while the corn and the olive branch represent peace and prosperity. The combination of those images creates a PA state flag that represents the state's hope for a safe and prosperous future. 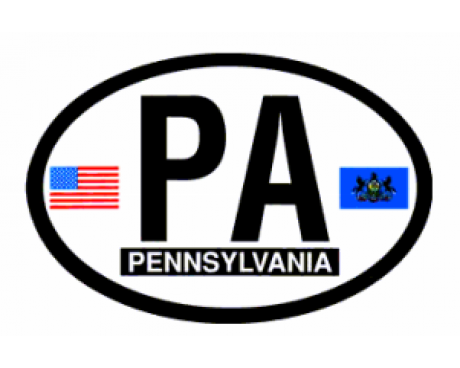 The Pennsylvania state seal was formally authorized in 1978, and the first Pennsylvania state flag followed the seal one year later. The original description of the flag was relatively vague, which lead to a wide variety of designs being used across the state. Many of the state's militia regiments chose to use an alternative flag that resembled the national flag with the state's coat of arms in place of the stars in the canton. That design rose to prominence during the American Civil War, but unlike many other military flags from the conflict it did not have a lasting impact on the state flag's design. 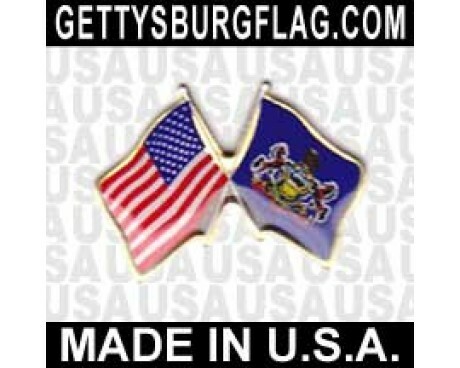 The government of Pennsylvania chose to standardize the flag by specifying its precise colors and dimensions in 1907. The Pennsylvania flag has not changed since that time, although an effort to add the state's name to the bottom of the flag began in 2005. The state's House of Representatives responded favorably to the proposal, but it has not been approved by the Senate of Pennsylvania at this time. 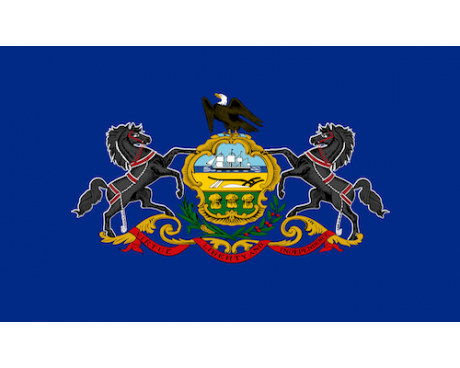 In 1777 the state seal of Pennsylvania was created and officially adopted in 1791. The shield is divided into three sections showing a plough, a ship, and three sheaves of wheat. The crest is an American eagle standing, and there is a reverse side to the seal. 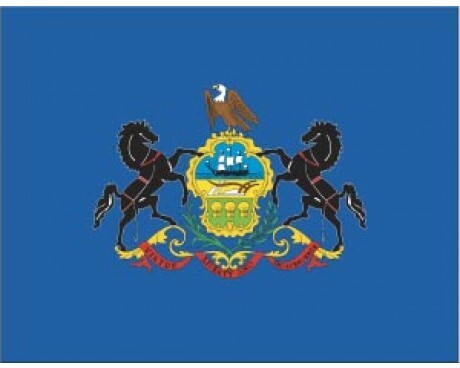 Pennsylvania's seal appears on the state flag together with supporters consisting of two horses. The state motto is on a scroll below some sprigs and laurel. The state flag was officially adopted on June 13, 1907 and the present form was specified in 1964. Led by William Penn, and settled in 1682 by the Quakers. During the French and Indian War, Pennsylvania's western part was acquired and Pittsburgh was founded. In September 1776 the independent government was established. On December 12, 1787, the state ratified the Constitution. Interested in flying another flag along with your Pennsylvania flag? Browse our American Flags and Historical Flags for some options that will nicely complement your new Pennsylvania flag. 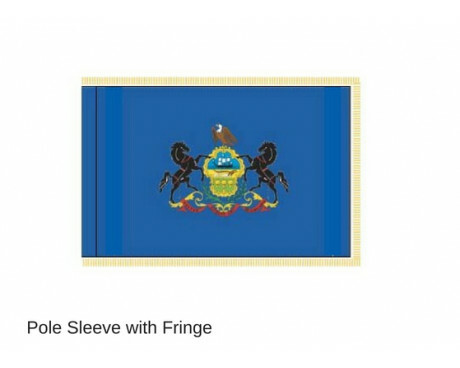 Looking for a way to display your Pennsylvania state flag? 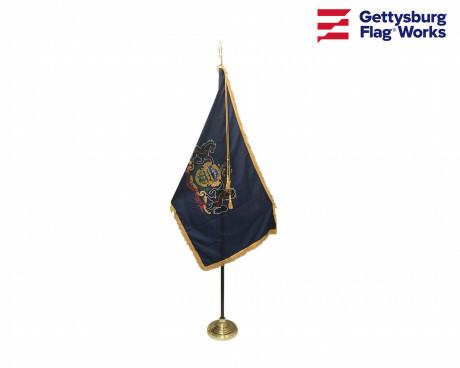 At Gettysburg Flag Works, we carry flag hardware, in-ground flagpoles, and wall and post mount flagpoles to make showing your Pennsylvania pride easy! 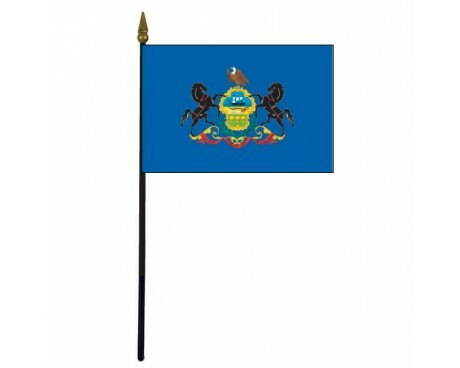 Order everything you need at once to make installing your PA state flag a breeze! 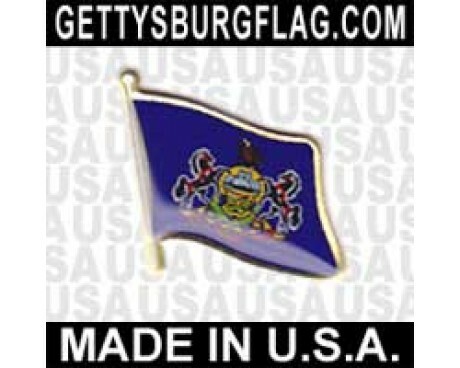 Have questions or can't find the Pennsylvania state flag you are looking for? Give us a call at 1-888-697-3524 or contact us online and we'll be happy to help you!